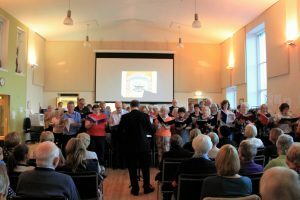 Come and Sing the Beatles was a great success with many people who love to sing swelling the ranks of the Pentland Singers in St Jospeh’s Hall at Balerno on Saturday. It was a fun day of rehearsals followed by a Come and Hear event, where family and friends came along to hear the fruits of our labour. We sang a variety of Beatles songs, including Hey Jude, All You Need is Love, and even the audience played their part in singing a moving rendition of Let It Be whilst the choir provided a harmonious backing for them. All in all, it was a great day with everyone enjoying themselves. Thanks to Genevieve Dawson for the pictures. 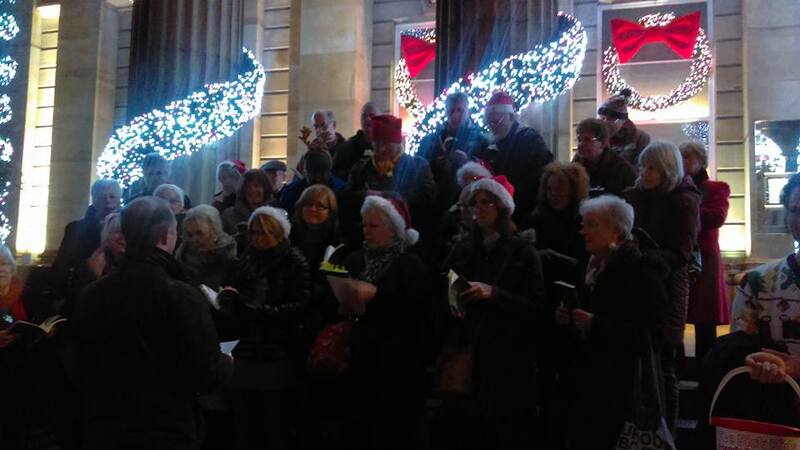 Well done to the group of Pentland Singers who took part in some carol singing inside Jenners and outside the Dome on Sunday 18th December in aid of the Sick Kids Friends Foundation. They sounded fantastic and definitely spread the holiday cheer! Merry Christmas everybody! 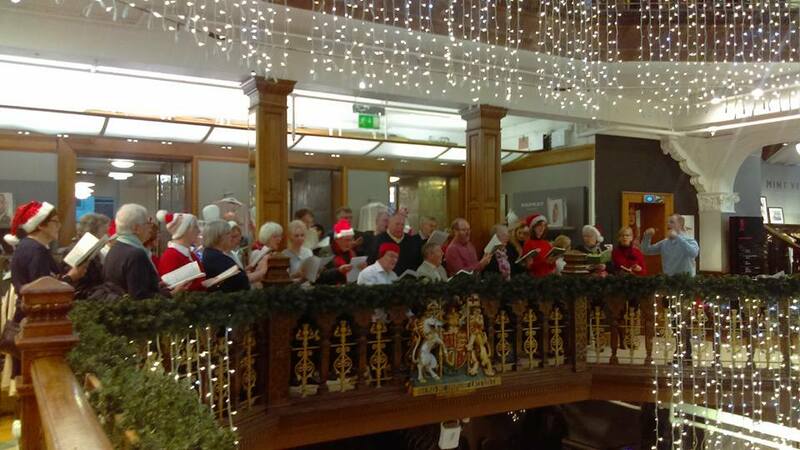 Pentland singers live in Jenners! We have been spoiled once again this weekend with wonderful choirs holding collections for us! It has been a fantastic year for the Pentland Junior Singers – they were Carol Singing at the RDA Christmas Fair, singing with the adult choir at the Christmas Concert, helping with fundraising for new staging, getting new t-shirts with their logo on – and as if that wasn’t enough, Jessica Leary their Musical Director, felt that it was time they took the limelight for themselves and showed their family and friends just what they have been doing with their Tuesday evening rehearsals and so they had their own concert on the 24th March at Balerno Parish Church. The church was packed with an enthusiastic and appreciative audience of over 100. Jessica conducted the singers through their repertoire to great applause. They sang I’d Do Anything, from Oliver, Edelweiss from the Sound of Music, The Rhythm of Life from Sweet Charity, and a medley from Joseph and his Technicolour Dreamcoat. Several of the singers had solo spots, and with no sign of stage fright or nerves, each one of them shone, and sang beautifully. The choir made a wonderful sound, the pieces where they sang in harmony were well balanced and the attention to Jessica’s direction was impressive. Not only were the singers showcasing their talent, but they were sporting the Pentland Junior Singers logo on their new t-shirts! The cost of the new T-shirts was covered by the choir members selling quizzes to friends and family. Alison Hynd, who is a volunteer helper with the PJS, drew up the quiz sheet based around Christmas songs and the children sold so many that the cost of the new t-shirts with the embroidered logo was covered, so well done to everyone involved! 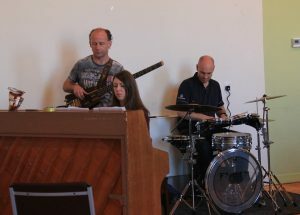 Here are some photos of the children in action at their concert.